RG Herald: It's Official, Falcon Levels at All Time High. It's Official, Falcon Levels at All Time High. The water level at Falcon Reservoir, located at Falcon Heights, Texas-Nueva Ciudad Guerrero, Tamaulipas, reached its highest level ever early on the morning of July 15. According to data from the United States Section of the International Boundary and Water Commission (USIBWC), at approximately 2:00 a.m. CDT, the reservoir elevation surpassed 308.1 feet above mean sea level (93.910 meters), the record established on October 19, 1958 just five years after the dam was constructed. The reservoir is still rising as floodwaters continue to enter from the Rio Grande and Salado River, a Mexican tributary. 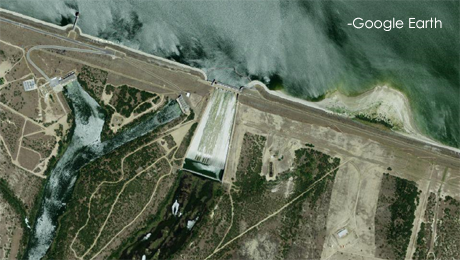 Releases from Falcon Dam downstream into the Rio Grande remain at 60,000 cubic feet per second (1700 cubic meters per second). Residents in the Rio Grande Basin should continue to monitor National Weather Service warnings and forecasts for updated information and river forecasts concerning flood conditions.